I’m not sure exactly what round of bread I purchased from Cafe Japon at the farmers market, but it is wonderful. I believe she said it was a whole wheat sourdough (it tastes as such), and the flavor, crust and chew is divine. I saved a couple of center pieces to make one big panini sandwich; large enough to serve myself and husband with a side salad. I made pesto on Friday and purchased fresh mozzarella (a large ball runs from $5-8 dollars, depending on weight) from Zingerman’s. I love the salty, creamy flavor of this local specialty. I’ve noticed Zingerman’s is teaching classes on making this cheese; sounds like a savory way to spend an afternoon. 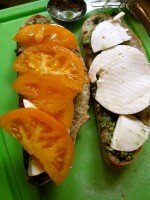 Spread 1 tablespoon pesto on each side of bread. 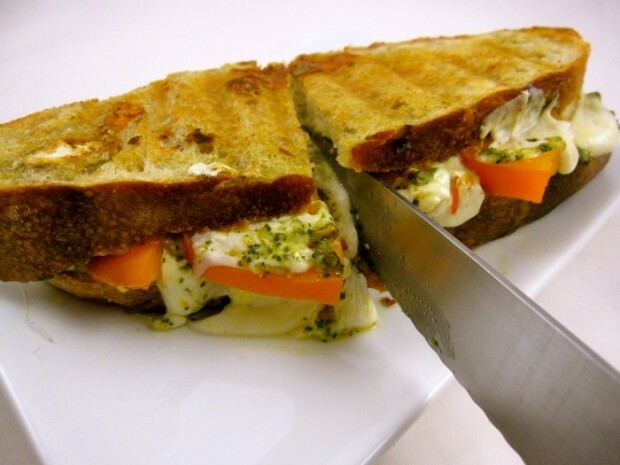 Evenly divide cheese over pesto on both sides of bread. Arrange cheese slice over both sides of bread. Place tomato slices on top of one piece of bread. Put bread together to made a sandwich. More Recipes Filed Under "Sandwiches & burgers"
Shrimp Burgers + the Naughty and Nice of Top 5 Burger Favs.